The beautiful city of Lyon is not only boiling over its heritage classified by Unesco, its bourgeois cuisine and its glorious industrial past. No, the Gallic capital is now assuming to be an European capital and not only a summer stopover on vacation. Lyon no longer hides! The city dares innovations, takes risks and exposes itself to the whole world amazed by the emergence of a city, more modern than ever. This openness to the world is clear if one attends the Festival of Lights that has become a major destination in December. Lyon has also invested the art market with the Biennale of Contemporary Art, currently underway, which competes without complex with the Paris FIAC. This week, we offer you to discover these three examples of Lyon’s sparkling. And three new hotels and trends to discover within a city that decided to expose in full light! It used to be a local celebration. A ceremony in honor of the Virgin Mary that only Lyon inhabitants used to celebrate by lighting, on the edge of their window, a candle or a small candle. 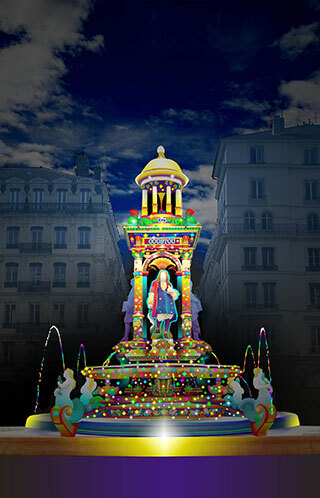 The Festival of Lights has long been a 100% Lyon event that used to be celebrated on December 8th, in a very Lyon intimacy. But in recent years, this meeting has become the occasion of a big festival that now attracts millions of visitors from around the world! Today, the festival spans an entire weekend from December 5th to 8th in 2015. This year, it should have been from 5 to 8 December 2015. After the Paris attacks of November 13, the city has decided to cancel the planned slew of illuminations. We still decided to tell you about this event and show you images you should have seen strolling in Lyon this weekend. To make you want to go next year because there is no doubt that the Festival of Lights will return! We like to admire the bridges and public buildings all lit in an original and spectacular way on this occasion. And many artists who dotted the streets and squares with their bright works. The Lyon Contemporary Art Biennial has become another major event for art lovers, after the Paris FIAC. Every two years, the city declared World Heritage by UNESCO, therefore welcomes the best of contemporary artists who enjoy to aback, shock, question and surprise visitors through their always iconoclastic work. This year, sixty artists from 30 nationalities flock to the Biennale. They are mainly exposed at the Sucre, this former sugar warehouse, on the River Saône, in the district of La Confluence, which offers its vast halls and elevators installation works particularly well staged in this green gross cement. 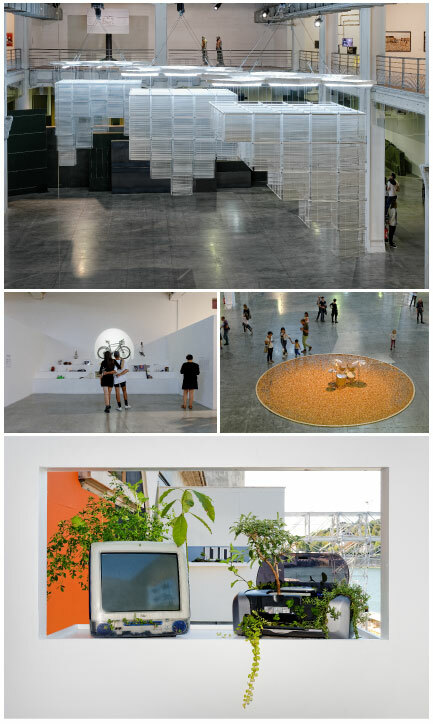 But the Biennale is also present at MAC Lyon and in Room 15 of the Confluence Museum. The theme of this 13th edition is “modern life”. The artists selected will give heart and joy to express their vision of the world today! The Lyon Biennial ends on January 3rd, 2016. It was the neighborhood of factories, jails and the wholesale market. 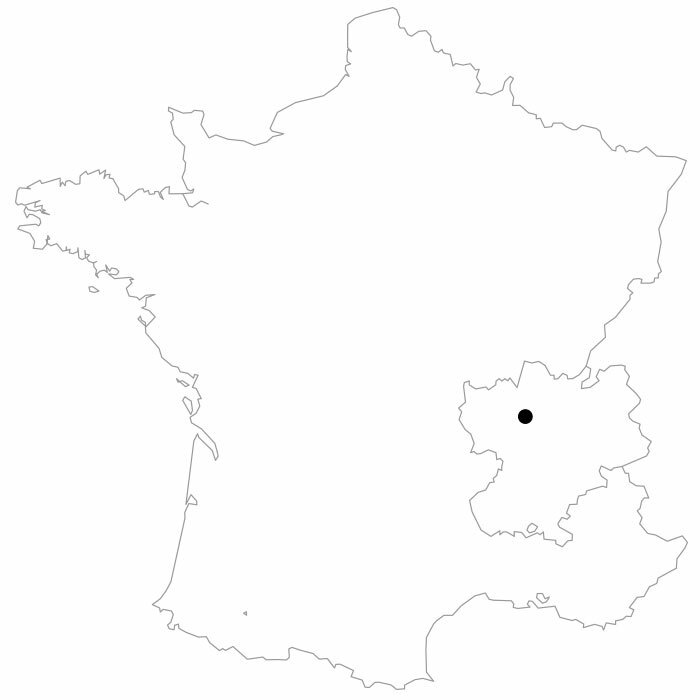 So, that was the southern part of the peninsula of Lyon who had been condemned and abandoned. But that was before ! Now, the whole part located below the Lyon Perrache station is boiling. A new neighborhood, which is called The Confluence, out of the ground. And it is here that the city of Lyon has given carte blanche to leading international architects for them to expose their art. In the end, on the Saône River, on the site of the old river harbor, the most amazing buildings follow one another. Jakob + MacFarlane installedtwo green and orange cubes straight out of a science fiction movie. Odile Decq, gothic and rock and roll architect, has cracked a “dark spot” for the GL Events group site. And she has even opened her own architecture school next to it. Christian de Portzamparc has signed the Hotel de Region. Rudy Ricciotti is completing its building and Jean Nouvel is starting its tower houses. An arch boardwalk that ends with a hyper modern shopping center opened on an artificial lake. A new district which will be completed in 2030 which still promises many surprises, like the two towers of 40 stories that must overlook the other centerpiece of the corner, already iconic Confluence Museum. A glass and steel vessel, quirky, epic, which contains a unique museum of science and civilizations in the world. In short, in the district of Confluence is taking shape day by day, the new face of Lyon who decided, more than ever, to expose itself as the European capital! Once again, Mama Shelter succeeded in opening a hotel which immediately became a place of life and encounter for Lyon and for passing tourists. It is the strength of Mama: the bar and the restaurant are always animated with life where we meet the local youth. Perfect to feel at home and meet the people who make the city. The rooms (from 70 euros) are small but have Imac with free internet and VOD. And the bedding is top! Anyway, when you stay at a Mama Shelter, you don’t stay in your room and you go down to the bar. Here a row of ducks ‘buoys’ welcome you for a drink or meal in the restaurant opened on the large vibrant living space. Mama Shelter is the first hotel a bit “roch’n roll” to make the city twist! The hotel Okko opened one year ago in the old building of the Prefecture of Police of Lyon, on the banks of the Rhône. Strategically located opposite the Presqu’ile, downtown Lyon. We like the concept of “all inclusive” that provides access to an 24/24 open Club from breakfast to evening aperitivo. We can at any time go down for a drink or grab something to eat while checking emails on a Mac freely available. No additional fees, everything is included in the room rate (from 120 euros). A new concept of business hotels that do not primarily make you feel to be in a business hotel! This new small hotel chain “four stars and no cloud” has not randomly chosen Lyon to open his second address after Nantes. It sensed the potential of this long dormant city, that is now hungry for new concepts. Straightaway, Okko has established itself as an iconoclastic hotel, very well located, that breaks codes.